Attorney Kristin E. Crossland was born and raised in Seabrook, New Hampshire. After graduating from the regional Winnacunnet High School, she attended Trinity College in Hartford, Connecticut, where she majored in English Literature and received a full academic scholarship. During her junior year in undergraduate school, she spent six months studying abroad in Uruguay, Argentina and Chile, and is fluent in both written and verbal Spanish. Attorney Crossland set the goal of becoming an attorney when she was in the fourth grade. She entered law school at the Northeastern University School of Law in Boston in the fall of 2012 with a focus on litigation. 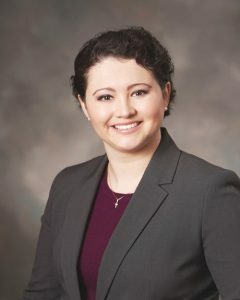 Through law school, Attorney Crossland completed a full year of legal internships prior to graduation, including clerking for the Honorable Judge T. Lu in the Massachusetts Superior Criminal Court, working in the Massachusetts State Senate, and working in the legal department at Raytheon Company. Attorney Crossland prefers the fast-paced environment of the courtroom and received Honors in her litigation courses for both criminal and civil procedure. While in law school, Attorney Crossland participated in scholarship programs to fund her higher education, but also to raise funding and awareness for individuals with rare diseases. She reigned as Miss Rockingham County in 2012 and raised over $11,000 at a charity event for Congenital Hyperinsulinism International (CHI) in honor of her late sister. She is also a fierce advocate for the Children’s Miracle Network. Upon her admission to the New Hampshire Bar, Attorney Crossland began working for the legal department at one of the country’s leading gym franchises. While she enjoyed her time there, her calling came from the field of family law. Attorney Crossland currently resides in Manchester, New Hampshire. In her free time, she enjoys listening to audiobooks, apple picking, taking her dog, Kairi for walks, and traveling. She looks forward to meeting new people through her work and helping them through the difficult parts of their legal journeys.